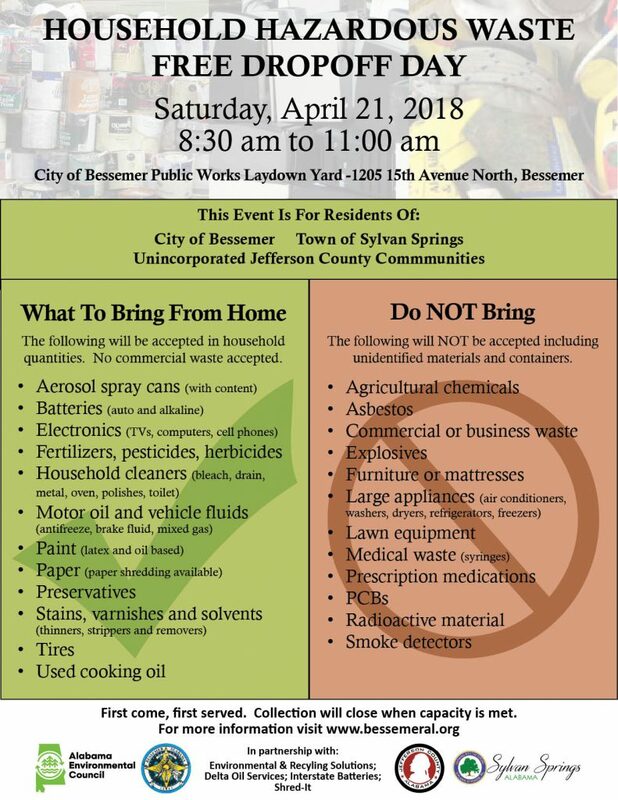 The city of Bessemer, in conjunction with Jefferson County and the town of Sylvan Springs, will host a Household Hazardous Waste Collection Day on Saturday, April 21, 2018, at the Bessemer Public Works Laydown Yard, located at 1205 15th Avenue North. Collections will begin at 8:30 a.m. and last until 11 a.m. Collections will only be taken from residents of Bessemer, Unincorporated Jefferson County and the town of Sylvan Springs. There is no charge for residents of those areas to bring hazardous household items for drop-off. The event will be held on a first come, first serve basis. Collection will close when capacity is met. Other partners in this endeavor include the Alabama Environmental Council, Environmental & Recycling Solutions, Delta Oil Services, Interstate Batteries and Shred-it. See the flyer for information on what items will be accepted and which items will not be accepted during the event.